Martin Truex Jr. nearly pulled off a come-from-behind win at Martinsville Speedway on Sunday, but Joey Logano nudged him out of the way to claim the first race of the NASCAR Cup Series playoffs Round of 8. Though Logano led 309 of the 500 laps, Truex Jr. made things interesting, climbing from fourth to second place in the final 20 laps. It appeared for a moment that Truex Jr. would beat Logano, but Logano did what he needed to do in order to claim a must-have victory — much to the displeasure of Truex Jr., who displayed his emotions after the race with two thumbs down as Logano celebrated. Behind Logano, Truex Jr. finished third (Denny Hamlin passed him at the last moment) and Kyle Busch finished fourth. A Stage 3 crash caused Clint Bowyer to have the worst showing among playoff drivers at 21st. 6:23 p.m. — Truex Jr. is NOT HAPPY about the physical ending. He tells NBCSN that Logano won’t win the championship. 6:15 p.m. — Those final last laps were remarkable. Wow. 6:14 p.m. — Logano wins! What a great job from him to hold off Truex Jr. He nudged the 78 car off his path to cross the finish line. 6:12 p.m. — What a finish we have here. 6:11 p.m. — Truex Jr. moves into second place with 10 laps remaining! Can he pass Logano for first? 6:07 p.m. — Twenty more laps. Logano, Keselowski and Kyle Busch lead the field. 6:06 p.m. — Harvick has been off the pace for much of the day, but he’s climbed to eighth place with 28 laps remaining. 5:57 p.m. — Bowyer spins after a crash with Jimmie Johnson. Big #NASCARPlayoffs implications as @ClintBowyer spins out and brings out the caution. 5:51 p.m. — It’s been a pretty clean run for the playoff drivers. 5:49 p.m. — Brad Keselowski is in the lead, but there are several cars close behind him. 5:43 p.m. — Right after the restart Chase Elliott has a car problem. Smoke from the No. 9 car, but @chaseelliott continues to roll, currently in P9. 5:33 p.m. — Kyle Larson is done. That’s a wrap for @KyleLarsonRacin . 5:25 p.m. — Logano being in contention shouldn’t come as a surprise. 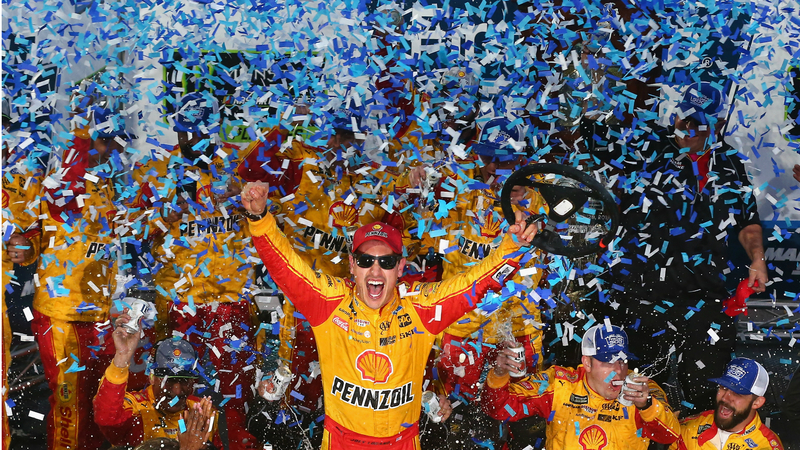 Joey Logano made two of the first three winner-take-all championship races at Homestead before missing the playoffs completely last season. If he wins today, Logano will have been a finalist in three of the five championship races. 5:17 p.m. — Another caution flag comes out. Timmy Hill’s car is on fire. 5:09 p.m. — Caution for William Byron. 5:07 p.m. — Truex Jr. passes Logano for the lead. 4:54 p.m. — Make that second place for Truex Jr. There are 170 laps to go. 4:51 p.m. — Truex Jr. is up to third place.
. @MartinTruex_Jr finally gets around @KurtBusch for third. 4:47 p.m. — Kevin Harvick is in 14th — lowest among playoff drivers. 4:31 p.m. — Ryan Newman receives a penalty. And that was just the end of Stage 2! 4:22 p.m. — Halfway done with the race. Logano is in the lead. 4:19 p.m. — It hasn’t been a good day for Kyle Larson. 4:14 p.m. — For the second time in Stage 2, Truex Jr. makes contact with another car. 4:10 p.m. — Weather could be an issue. We’re keeping our fingers crossed it’s not. 4:03 p.m. — Bowyer and Truex Jr. clash. Contact between @ClintBowyer and @MartinTruex_Jr ! 3:59 p.m. — We’re 185 laps in. 3:49 p.m. — Joey Logano has the lead. The Busch brothers are in second and third. 3:45 p.m. — Time to end the drought? 3:30 p.m. — There are 17 more laps left in Stage 1. Truex Jr. is up to 10th. 3:23 p.m. — Playoff drivers are holding steady, occupying much of the top 10. The championship drivers are all inside the top-10 … except Martin Truex in P14. 3:18 p.m. — Another caution is out, this time for Jimmie Johnson. Caution is out for @JimmieJohnson at @MartinsvilleSwy . 3:09 p.m. — Truex Jr. hasn’t been sharp so far, but there’s still plenty of time. Chase Elliott is working on Newman for 10th — and a championship point. 69 left in the stage. 3:06 p.m. — Kyle Busch remains in the lead through 50 laps. 3:03 p.m. — Caution. Jeb Burton hits a wall. 2:56 p.m. — A little teammate drama going on here. Elliott is in 17th right now. 2:49 p.m. — Through the first 15 laps, Kyle Busch, Denny Hamlin and Clint Bowyer are in front. 2:43 p.m. — Truex Jr. is among the drivers starting from the rear this afternoon. 2:34 p.m. — We’re just about underway. 1:38 p.m. — Johnson officially has a new sponsor after Lowe’s ended its partnership with him. NEWS: @JimmieJohnson and @TeamHendrick announce Ally as full-season primary sponsor for No. 48 team in 2019. 1:31 p.m. — Big news upcoming for Jimmie Johnson.